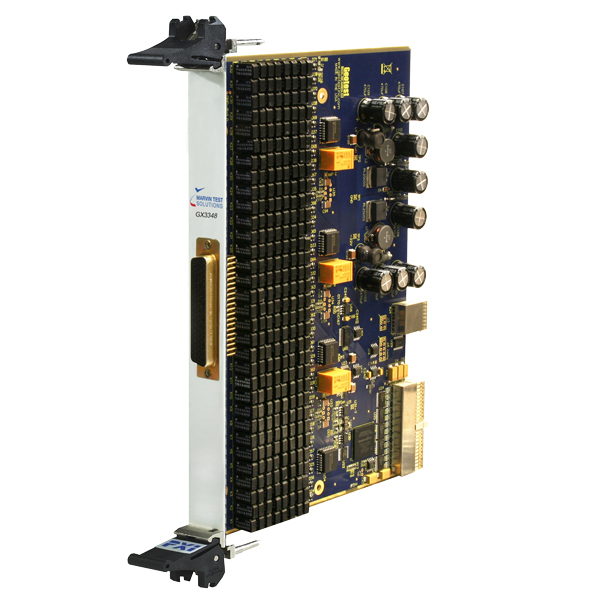 PXI 6U Multi-Channel Analog I/O Card - GX3348 | Marvin Test Solutions, Inc. The GX3348 is a multi-channel analog I/O 6U PXI card which provides (3) programmable sources, a ground source connection, and a 4 x 48 or 4 x 64 matrix - allowing the user to route the 3 sources, or ground to any of the 48 or 64 I/O channels. In addition, each I/O channel can be connected to a 16-bit A to D converter, providing DC voltage measurement capability for each channel. Amplifier Output Swing -20 to +32 V max.